We are near the deadline for the Supreme Court to decide two equally historic cases: US v. Texas and Whole Woman’s Health v. Hellerstedt. Women and their health and well-being are at risk in these cases, and the stakes could not be higher for the women who sit at the intersection of both — undocumented women in the United States who currently live in fear of deportation and often go without the health care they need. In Whole Woman’s Health v. Hellerstedt, the first major abortion case to be heard by the Court in more than two decades, the Court is considering two Texas abortion restrictions, which, if upheld, would leave the state with just 9 health centers that offer safe and legal abortion for 5.4 million women of reproductive age — down from approximately 40 health centers that were in operation before the law was proposed. For undocumented women in border counties in Texas, the brunt of this ban is felt more acutely: The reality of border patrol checkpoints make it impossible for women to travel north to other cities to seek safe, legal abortion. This reality is alarming in a state where self-induced abortions are more common among Latinas in communities existing along the U.S.-Mexico border. In US v. Texas, the future of 5 million undocumented mothers, fathers and young people is on the line. Led by Texas, the challenge brought by 26 states would block the President’s new Deferred Action for Parents of Americans and Lawful Permanent Residents (DAPA) program, as well as his expansion of the program for DREAMers, known as Deferred Action for Childhood Arrivals (DACA) — actions that would give millions of people the chance to live and work without the fear of deportation. We are two women who were both born in Mexico but call America home, growing up in Texas and Nevada. We have different stories: One of us is the child of a single mother, and the other is the oldest of 4 siblings in a mixed-status family. But a lot of our experiences — the culture of fear we have witnessed our mothers live through, the ability to breathe a little easier after being granted DACA, and our commitment to continue fighting until the rest of our community is able to live complete and healthy lives in this country — are the same. Both of these cases impact us equally. One will decide whether or not our families and communities are able to stay together, and the other what we can and cannot do with our own bodies. As two young undocumented women who have grown up in this country, we sit at the intersection of immigrant and reproductive justice — fighting xenophobia and misogyny. If the Supreme Court allows the health center shut-down laws that are at issue in Whole Women’s Health v. Hellerstedt to remain in place, it would mean that for too many people in Texas, the right to access an abortion safely and legally is one they cannot exercise. Politicians’ deceptive tactics and attacks on women’s health care will remain unchecked. The stakes in this case cannot be overstated, and the consequences may reverberate far beyond Texas. This is disproportionately true for immigrants, who face steep barriers to accessing quality health care overall. Similarly, the attempts to block implementation of DAPA and the expansion of DACA underscore the complete disregard many politicians have for the health and safety of our communities. DAPA and the expansion of DACA will give our loved ones — parents, single parents, and adults without children — the chance to remain in the same country together and work toward a better world for our communities. And that better world is contingent not only on being able to keep our families together but the ability of our families to access health care. DAPA and DACA are invaluable – they are an important step to breaking down the maze of barriers we encounter when seeking reproductive health care. 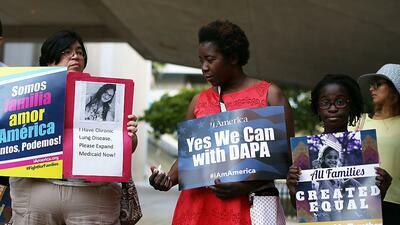 While DACA has allowed us to access reproductive health services at our universities or through employer-sponsored health insurance, DAPA would permit our mothers to travel to receive health care freely, with valid forms of immigration identification and documentation, and confide in their doctors without worrying that they will be turned in to Immigration and Customs Enforcement (ICE) custody. Though DAPA and DACA eliminate the fear of deportation for many, they are also an incomplete solution. Ultimately, unfettered access to the care women like us and our families need, including the ability to fully participate in the Affordable Care Act and to be permanently integrated into the United States on a path to citizenship, are the solution. Too often, racial profiling, immigrant detention, and deportations increase health needs in immigrant communities. We have seen how these barriers place many at risk of dying from preventable diseases. For instance, many immigrants are less likely to receive screenings for and more likely to die from breast and cervical cancers, and some immigrant groups have higher rates of HIV and other sexually transmitted infections than others in the United States. All of these health issues could be detected, and in some cases prevented, with equal access to care. An attack on DAPA and DACA and abortion access is an attack on women like us and our mothers. An attack on our mothers is an attack on our communities. We all deserve access to compassionate and confidential care and to be safe and healthy, regardless of our gender or immigration status. We are womxn and we are immigrants. A person’s right to self-determination should not depend on where they live or where they are from. We demand the autonomy to make decisions about ourselves—the families we choose to create, the place we choose to live, and how we take care of our health. We won DACA, we will win immigration reform, and we will protect and expand reproductive rights no matter what happens this June. Throughout history, we have been resilient despite political attempts to control our bodies, and we continue to be strong in the face of adversity. The battle for our dignity and respect at the Supreme Court is only the beginning — we will continue to fight until everyone in our community is able to live a safe, healthy and empowered life. We are finally able to build our future because the fear of deportation is no longer in control of our daily lives. We choose what’s best for ourselves and we are not going back. We are Maria Reza and Miriam Cadenas, and we’re undocumented and unafraid.